This is an opinionated article. I have my own personal reasons for choosing these moments and where I rank them. I also tried to throw some variety in there. Enjoy! Moore carries the puck into the zone after exiting the penalty box. His initial chance was denied, but he continues to battle as Brassard and Hayes join the attack in an attempt to apply the pressure. Moments after doing just that, Moore finds himself in front of the net, and the puck that Hayes flung into the crease bounces off his leg and into the net. Not the prettiest goal out there for sure, but it came in the late stages of the game and ended up being the winner to an important Game 1. The Lightning battle for the puck on the powerplay in attempt to tie the game at 1. Former Rangers captain Ryan Callahan revives the puck along the near side boards. He carries it to the left circle, but fans on his shot. The puck rolls to Stamkos who is parked in the crease, just to the right of Lundqvist. He shoots as quickly as he can, but Hank slides across in time to make the left pad save. This save kept the Rangers ahead in an important game 6 and helped kill off the rest of the penalty. 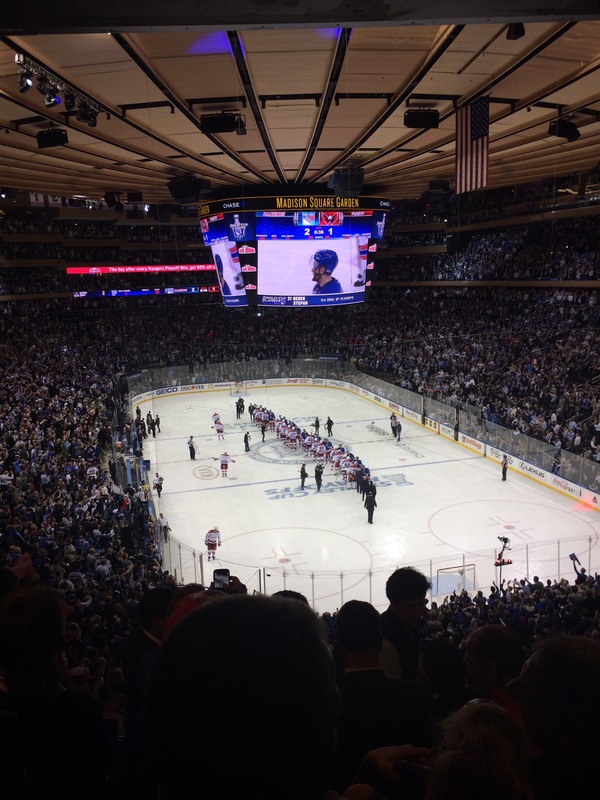 The Rangers gain control of the puck early, as the crowd buzzed with excitement at the beginning of a new playoff run. Nash carries it along the boards in front of the Rangers bench. He winds up a slapshot in order to test Fleury early; and he fails that test. Fleury leaves a juicy rebound, right in front of him. Brassard, already streaking towards the net, swoops in and cleans up the mess. This early goal not only gave the Blueshirts the lead, but showed that they were not to be taken lightly. The Capitals break out of their zone and pass the puck up ice to Jason Chimera. He carries in, moves in on Keith Yandle, and throws a backhander at the net. Lundqvist fights it off, but Brouwer is right on top of the rebound with a gaping net to shoot at. Henrik slides across and kicks out the right pad to rob Brouwer’s backhand attempt. Once again, Hank makes an outstanding save to preserve the 1-0 lead, and stuns the crowd in the process. 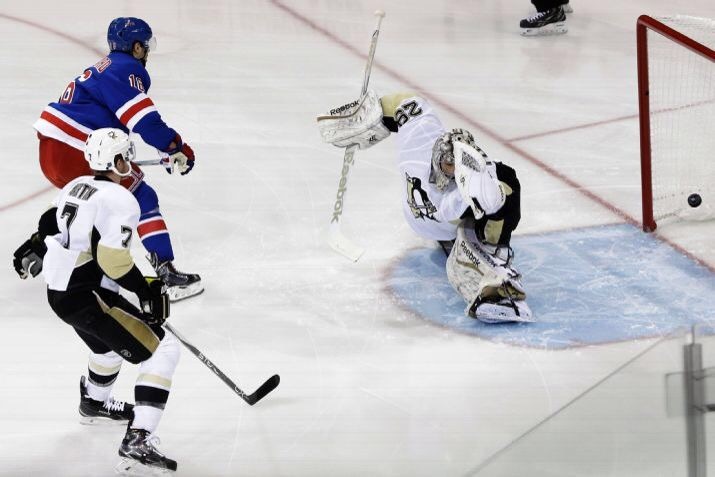 Hagelin retrieves the puck behind the net. He circles back around looking for an oppurtunity. Hagelin fires a wrist shot from the right circle and scores! A collapse in the Penguins defense gives Hagelin too much room, and he puts it short side on Fleury to win the series in 5 games. This was a great moment, and a series finisher, but I will give my reasons for this not being higher on the list. Early in the OT period, the Rangers win the offensive zone faceoff and control. After cycling, Marty St. Louis whips around from behind the net and throws it towards the crease where a scramble ensues. Hagelin finds the loose puck and throws it across the goal line under two Penguins players to Hayes. Hayes taps the puck in under a sprawling Fleury for the OT winner in Pittsburgh, and gave the Rangers a 3-1 series lead! My reasoning for having this higher than Hagelin’s OT winner? This was the difference maker. This was the difference between a 2-2 series tie and a 3-1 commanding series lead. When the series was 3-1, mostly everyone expected the Rangers to close it out. That may not have been the case, had the series been 2-2. Also, Hayes is a rookie and this was on the road. Always nice to see a stunned Penguins crowd. This was Kreider’s night. His first goal, comes from his skill when it comes to protecting the puck in a 1 on 1. Kreider uses his bigger body to protect the puck, takes it all the way to the net, and backhands one between the pad and blocker of Braden Holtby. His second goal, was caused by a mishap in the Capitals’ defense with almost no time remaining. The puck rolls away from John Carlson, and Kreider moves around him to tap it into the empty net. This goal gave the Rangers a strong 2-0 lead going into the second period. 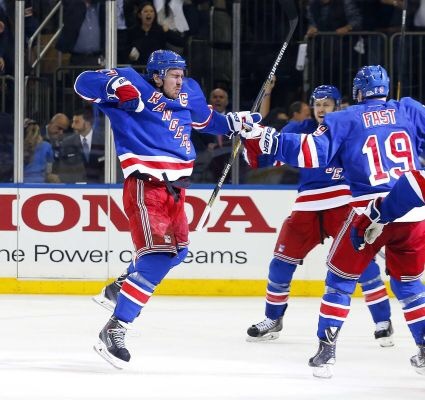 Kreider scored his first goal under a minute into the game, and his second with under a second left in the period. The Rangers season is on the line with just over a minute to go. Henrik Lundqvist begins his journey to the bench as a last ditch effort to tie this game, and surely enough, Kreider fires a one timer past Holtby in the dying stages of the game to send it into OT. Then, around halfway into the OT period, the Capitals slip up again and it costs them. Jesper Fast intercepts a pass in the neutral zone, takes it in on an odd man rush, and finds Derek Stepan across the ice in the slot. Stepan fakes a wrist shot and drops it off slightly for the captain, Ryan McDonagh who steps into it and fires a one timer that deflects of a skate and goes in. Every Rangers fan watching was ecstatic at the fact that the Blueshirts would live to fight another day, ready for a game 6 in Washington. Not exactly 1 moment, but I’ll let it slide. 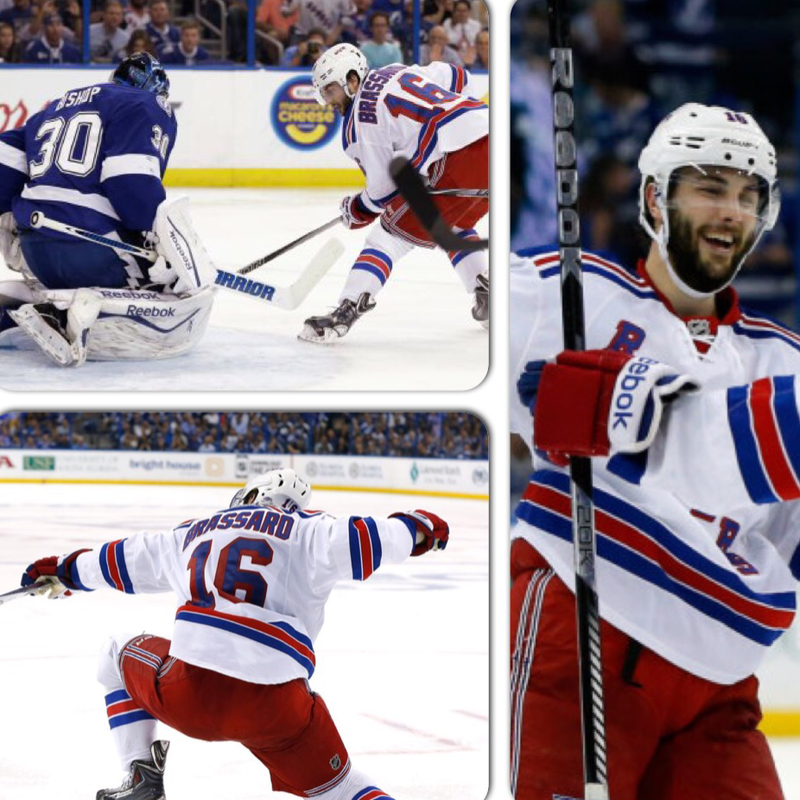 Brassard nets his first playoff hat-trick in a crucial, do or die game 6. His first goal came off a feed from J.T Miller in front , as he backhands it past Ben Bishop. His second goal, created by yet another beautiful cross ice pass from J.T Miller, gave the Rangers a commanding 5-1 lead. His final goal, an empty netter from the red line finished off his first ever playoff hat-trick and was the icing on the cake to a 7-3 win in Tampa. Brassard also assisted on two other goals that night, granting him a total of 5 points. 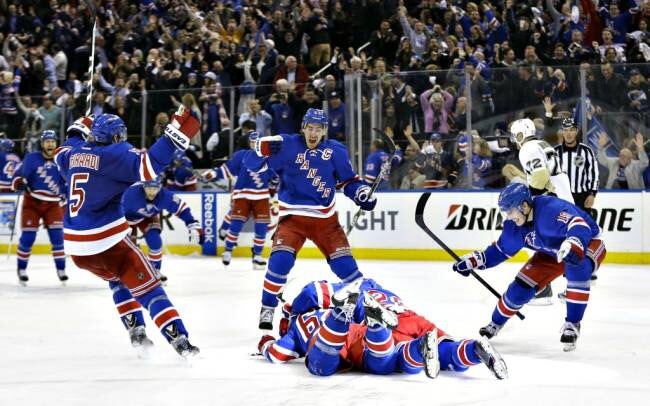 I may be slightly biased towards this moment (from experiencing it first hand as the picture indicates), but I think most Ranger fans can agree and put this moment at the top. 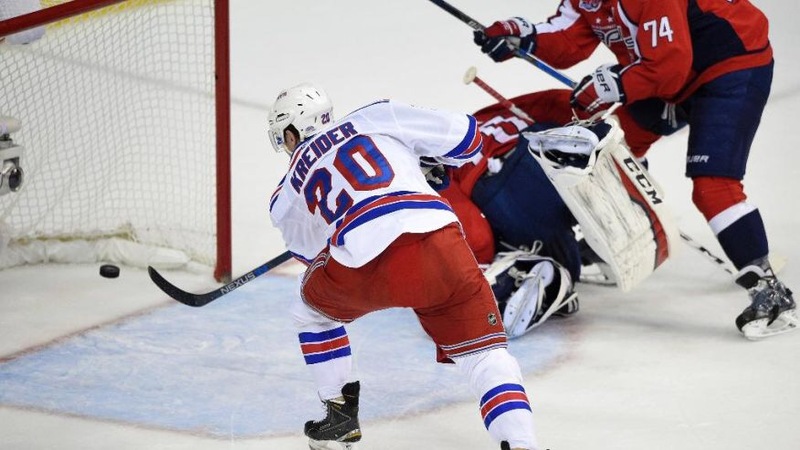 After fighting off a relentless Washington attack, the Rangers were lucky to make it out of their zone. A few moments later, Washington ices the puck and the Rangers get fresh legs on the ice, specifically the Fast-Stepan-Kreider line which has been good all playoffs long. Stepan wins the faceoff back and quickly makes his way to an open area of the ice, just right of the left circle. A shot from the point redirects in front, right to Derek Stepan. Time froze for a moment when Stepan had control of the loose puck with a wide open net in front of him. He lets the shot go and it makes its way over Holtby’s desperation save attempt. MSG went nuts, and the comeback from being down 3-1 in the series was complete. 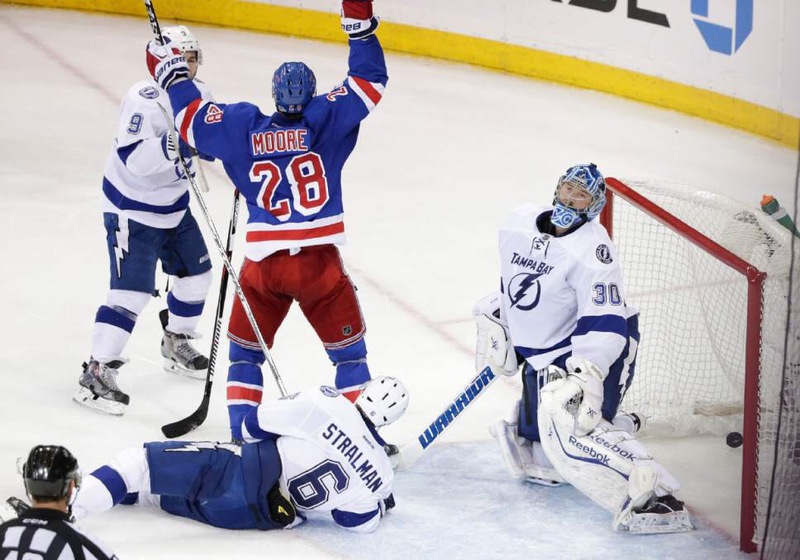 Another game 7 win for the Rangers in the books, and they were on their way to the Eastern Conference Final yet again.